On 3 October 2018, the bell ringers of St Paul’s Church, Wooburn rang the bells in memory of Edgar Howard, a former ringer who died 100 years ago in the Great War. Edgar Howard was born into an old Wooburn family on 18 May 1886. His parents, James and Elizabeth lived and worked in Wooburn Town, in the shadow of the church, and were actively involved in church life. James was the local undertaker and Edgar was a chorister. Both were members of the local guild of bell ringers, with James holding the post of Foreman of the Wooburn ringers in the 1890s. Edgar was a member of the Oxford Diocesan Guild from 1903, shortly after the bells were rehung in a modern metal frame, and was a Wooburn ringer for over ten years before the outbreak of war. Edgar joined the Third Battalion of the Royal Fusiliers in November 1914 and served in France, Egypt and Greece. 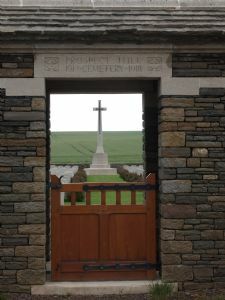 Returning to France in July 1918, he was promoted to the rank of Corporal, but was killed by a shell on the battlefield between Cambrai and Saint-Quentin on 4 October, just five weeks before the end of the war. 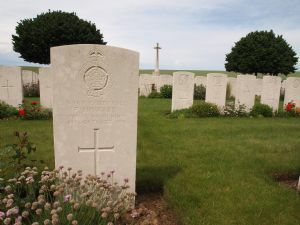 His commanding officer, quoted in the Bucks Free Press, said “He was greatly respected and liked by all the men in the platoon, and we feel the loss of a brave and good comrade. 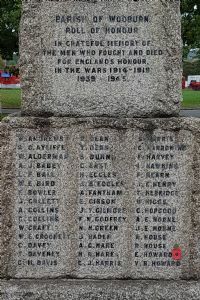 He died a brave man.” He was buried in Prospect Hill Cemetery, close to where he fell, and is remembered on the Wooburn war memorial, St Paul’s Church memorial tablet and in the national bell ringers’ rolls of honour. In memory of his life and of his sacrifice, the bells were rung on the eve of the centenary of his death. During the evening the bells were rung in ‘Queens’ and ‘Kings’ and the tenor was tolled 32 times, once for each year of his life. Henry Howard, aged 13, and also a descendent of the Howards of Wooburn, rang the same bell that Edgar Howard is recorded as ringing during his time in the tower. Please click here to see our June 2014 article about bellringing! Please click here to see our Spring 2013 article about local ringing and the health benefits! Welcome to the world of bell ringing! English church bells have rung out for hundreds of years. In learning to ring you join about 40,000 other ringers across the countries who are keeping the tradition alive. Firstly, and most importantly, the bells can be very dangerous if not handled correctly. Listen carefully to your instructor and do not touch anything unless specifically told to do so. Injuries are rare if instructions are correctly followed. Ringing a church bell is a skill, not a test of strength. However, the bells are heavy, and very old or young learners may have difficulty. In such circumstances, it may be appropriate to wait until you are stronger, or learn to ring at another tower with lighter bells. It takes 6-12 half hour sessions to learn to ring a bell unaided. You will not be allowed to ring alone until you can demonstrate you can do so safely, without endangering yourself or others. Most handling practice will be on a ‘tied’ (silenced) bell on a one to one basis with the instructor – where appropriate, child protection guidelines will be followed. Gradually you will be introduced to ringing with others. At this stage, listening, rhythm and ‘rope sight’ (watching) become essential aspects of good ringing. After 3-6 months of ringing regularly with others you will start to ring simple ‘changes’ in the bell order, which require some manipulation of number sequences. Once you are able to ring reliably and competently, you will be expected to ring for service – this is the main reason why the bells are rung. Once you have reached this stage you can be elected to the Oxford Diocesan Guild, the local association of bell ringers. After about a year the ‘methods’ of changing the bell sequences become more complex and visualising patterns will help you to understand what you are ringing. Ringing is a team activity and every church has its own ‘band’ of ringers who work closely together. You need the help of your fellow ringers in order to progress, and everyone in the band will be given a fair share of the ringing opportunities. That means sometimes you will be asked to sit out and watch during practice whilst others have their turn. But as you progress you will become more able to help other ringers yourself. Ringers from other churches will visit the tower from time to time and they will also use their experience to help you along. Whatever stage you are at, if there is something which you don’t understand, ask your instructor or one of the other ringers. If you don’t understand the explanation you get from one person, speak to someone else. Teamwork is the key to achieving good ringing and all members of the band are encouraged to contribute positively to creating a relaxed and fun learning environment. To develop a strong sense of togetherness, the band sometimes socialise outside the tower, engaging in non-ringing activities, as well as ringing at other towers. Competent ringers will always be made welcome in the thousands of towers across the country and hundreds more in countries around the world. Although ringing a bell is a physical skill, ringing with others also requires you to understand the sequences and patterns you are ringing together. Therefore, homework plays a part in ringing. You may be able to do your homework in the tower whilst you are sitting out, or you might be asked to think about a particular topic before the next practice. The more homework you do, the more you will get out of your ringing time. 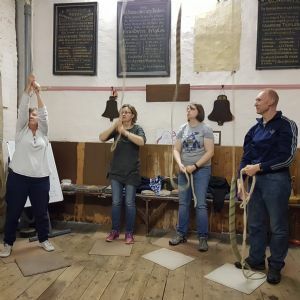 Whilst there is virtually no limit to how complex the ringing can become, the most important aspect of ringing is to achieve a good standard of ‘striking’ (accuracy) so that the ringing sounds smooth and the bells are evenly spaced, with no clashes. Striking is something that all ringers can concentrate on, whatever level of ringing you have reached, and striking competitions are held to test how good different bands are. The timeframes outlined above are for guidance only. Some ringers progress more quickly and others far more slowly, for many different reasons. There is no right speed – your instructor will tell you when it’s time to move on to the next stage. If you’re not happy with your progress, please speak to the tutor or other ringers – you may decide ringing isn’t for you. 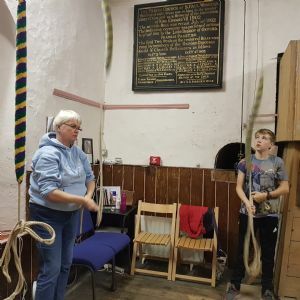 That’s okay – you can’t be expected to know whether you will enjoy ringing until you’ve tried it and it can be quite different to what you imagined it would be like. Notice especially all the different skills you’ll need to develop as you progress.